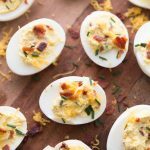 These Instant Pot Deviled Eggs are a a fun and festive twist on the classic party app. They are perfect for the 21 Day Fix, Weight Watchers, and anyone following a Keto or low carb plan. 3 pieces of cooked turkey bacon, diced, and 1 additional piece for topping **Tip! Use the saute function of your Instant Pot to cook your bacon! Add 1 cup of water in your Instant Pot and place 6 eggs on top of your trivet or steamer basket. If you don’t have either one, you can place your eggs right in the water. Lock lid. Set your Instant Pot for 5 minutes on Manual. When cook time is over, do a 5 minute Natural Release. After the 5 minute Natural Release, release the rest of the pressure. When it’s save to open your Instant Pot, remove your eggs and place them in a 5 minute Ice Bath. Place eggs in your refrigerator until ready to fill. For the deviled eggs, cut each egg in half, top to bottom. Remove yolks from the eggs and mix in mayo, greek yogurt, mustard, lemon juice, 3 pieces of bacon, cheddar, and a sprinkle of sea salt. Mix until smooth, then spoon the yolk mixture into the egg halves. Top with additional bacon bits, cheddar, and chives. Sprinkle with paprika.